It was Disneyland Half Marathon's 10th anniversary weekend so I wanted my race costumes to reflect stuff from the parks. Rides are nifty but let's not fool ourselves here, it's all about the food and indulging in treats. And what lights our foodie fancy is the beaming trifecta of turkey leg, Dole Whip, and the churro. 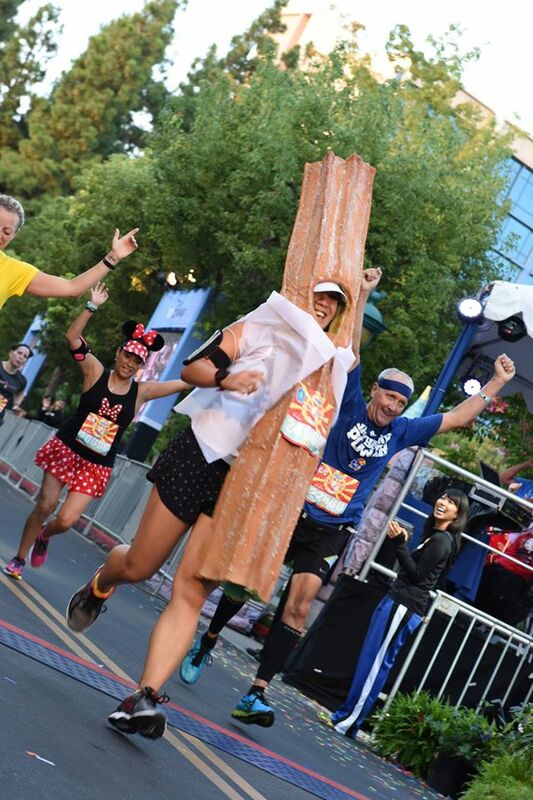 Well, I realized that I can't really just buy a churro suit. 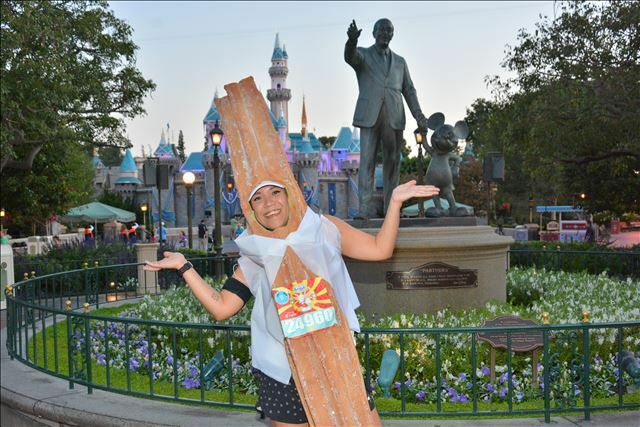 The churro cosplay market has not taken off yet, so I had to make one from scratch. What the suit is, essentially, is a sheet of pleated zig zag foam. I lined the surface with brown spandex (I used spray adhesive) and then just folded it up like an accordion and stapled my way down every fold. I used a lot of staples. You can see from the photos that only the portion above my shoulders it a complete wrap-around whole churro, and the suit from neck to below is just the front half with no back. I gave it a nice toasty highlight job with spray paint, and splattered my sugar mixture all over. It took about 3 days to dry completely. The cap I was wearing held the suit up and I did use some fabric table to tape the suit to my running top for extra stability. The "wax paper" jacket was basically a rectangle with two arm holes I made the morning of the race. And to make sure I didn't look like a running turd log, I hid pieces of cinnamon and sugar car air freshener into the suit so I smelled delightful. Yeah, I was not prepared for the reaction it had on people. I couldn't really hear anything because of my earphones and the foam so I completely missed all the race announcer hooplah. I'm glad it made a lot of people crack up!